This luminous cube, which can be used as a wall or ceiling light, is a result of conceptual synergy between form and function that is typical for Artemide lamps and the joyful vitality of Mendini objects. The light source is hidden in the truncated edge and, on the inside, there is a threaded socket which allows you to fix it on a wall or ceiling. 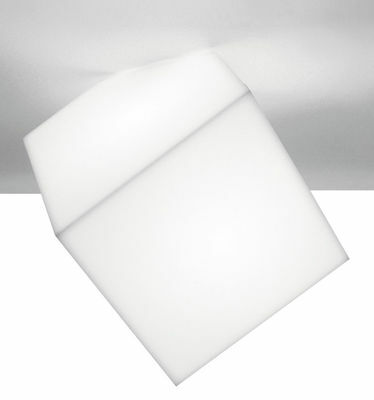 The cubic, moulded polypropylene diffuser provides excellent light diffusion. Its extreme simplicity and pure geometric form make this lamp absolutely versatile and suitable for private as well as public settings. Edge comes in two size versions: 21.5 or 30 cm side.